ETFGI, a leading independent research and consultancy firm on trends in the global ETF/ETP ecosystem, reported today that assets invested in Active ETFs and ETPs listed globally reached a new high of US$95.9 billion, following net inflows of US$3.59 billion and market moves during July, according to ETFGI’s July 2018 Global Active ETF and ETP industry landscape insights report, an annual paid-for research subscription service.? “The S&P 500 gained 3.72%, international markets ex US were up 1.93% and emerging markets up 2.81%. Investors are still concerned about the impact of trade wars and Brexit,” according to Deborah Fuhr, managing partner and a founder of ETFGI. At the end of July 2018, the Global Active ETF/ETP industry had 524 ETFs/ETPs, with 640 listings, assets of US$95.9 Bn, from 104 providers on 18 exchanges. 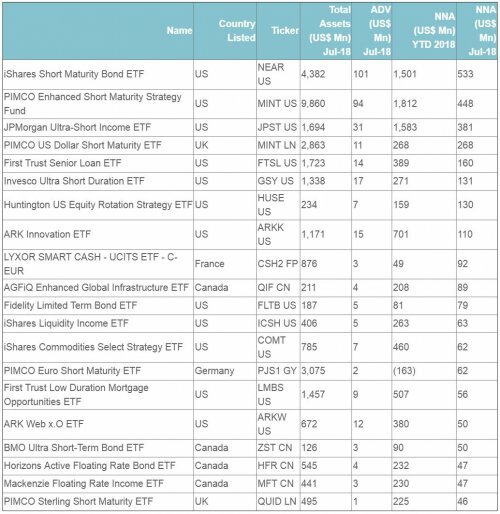 Due to net inflows and market moves the assets invested in Actively managed ETFs and ETPs listed globally increased by 4.70% during July, from $91.6 Bn at the end of June and have increased 26.1% year-to-date, from $76.0 Bn. Fixed income products gathered the largest net inflows during July, with $2.86 Bn bringing the year-to-date total to $13.3 Bn. Equity based products gathered net inflows of $660 Mn during July bringing the year-to-date total to $5.10 Bn. Commodity based products experienced net outflows of $8 Mn during July 2018 bringing year-to-date net inflows to $1.90 Bn. Investors tended to invest in short term, broad/aggregate fixed income funds during July 2018. The iShares Short maturity Bond ETF, trading under the aptly named (NEAR US), saw the greatest net inflows during July with $553 Mn. This was followed by the PIMCO Enhanced Short Maturity Strategy Fund (MINT US) with net inflows of $448 Mn during July. 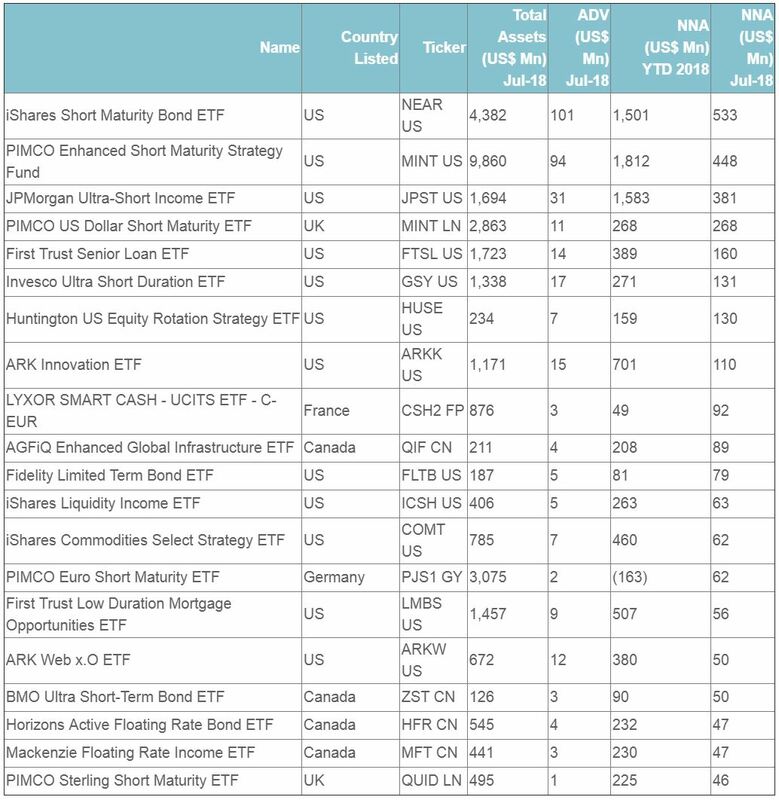 The top 20 Actively managed ETFs/ETPs, by net new assets during July, saw inflows totalling $2.90 Bn and collectively have $32.5 Bn in assets under management.